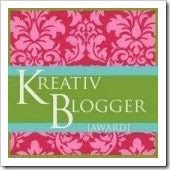 I am honored to receive the Kreative Blogger Award from my watercolor friend Teresa from Spain. As such, I need to list seven things about myself so here we go. 1. 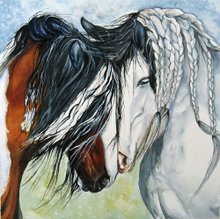 I am a watercolor artist specializing in animal portraits. 2. I also airbrush in acrylics, resin horses for resale. 3. I am a dyed in the wool animal lover. 4. I have three rescue chihuahuas and one Miniature Pinsher. 5. I belong to TIBBP, an international horse rescue group. 6. I raise pure bred endangered chickens. Now I have to pass this award on to seven bloggers that should be included in this list of recepients. Love getting to know you a little better with those 7 random things :) and honestly I didn't even know there were endangered chickens! Endangered chickens? Not at Gina's place! haha I didn't know you passed this on to me, Gina - I'm being a bad blogger lately and not checking on all my faves! But thanks so much for thinking of me.